Hanging Bride. The 'Puente Colgante' suspension bridge once hung over the Pasig river and was known to be the first of its kind in East Asia (1852). Photo courtesy of Filipiniana.net. In the latter part of the 19th century, Manila was a booming metropolis, worthy of the sobriquet “Pearl of the Orient”. The city government was paving new streets and commissioning new bridges to help the rising economy. One of the symbols of Manila’s, and the Ynchausti y Companias’ affluence was the Puente Colgante (“Hanging Bridge”), built by Matias Menchacatorre and originally named Claveria bridge, after governor Narciso Claveria y Zaldua. In Manila My Manila, Nick Joaquin described the bridge during the dawn of the 1870s, “Across the city’s river now arched…the amazing Puente Colgante, suspended in the air, like a salute to the age of science and engineering.” The Industrial Age found its expression in the Philippines in the form of a bridge unparalleled throughout Asia. An article by Alejandro R. Roces originally published in Philstar.com. Alejandro R. Roces/Manila. Infrastructure-wise, the Philippines has two major needs: better roads and bridges and a building that, when seen, automatically brings to mind our country. There are only a handful of structures around the world that are irrevocably linked to their city: the Empire State Building, the Eiffel Tower, the Sydney Opera House among them. These buildings have also been harbingers of urban renewal and preservation. In Bilbao, in the Basque Country, the city government built the world famous Guggenheim Museum designed by Frank Gehry. Its completion spurred a renaissance in the city. Manila, with its rich and varied history, is primed to be the world’s next great story of urban renewal and conservation; if only we have the will to do so. In the latter part of the 19th century, Manila was a booming metropolis, worthy of the sobriquet “Pearl of the Orient”. The city government was paving new streets and commissioning new bridges to help the rising economy. 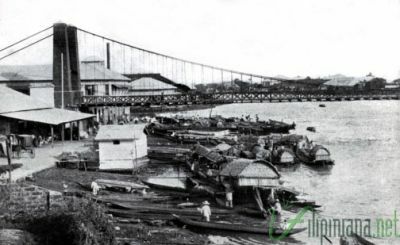 One of the symbols of Manila’s, and the Ynchausti y Companias’ affluence was the Puente Colgante (“Hanging Bridge”). In Manila My Manila, Nick Joaquin described the bridge during the dawn of the 1870s, “Across the city’s river now arched…the amazing Puente Colgante, suspended in the air, like a salute to the age of science and engineering.” The Industrial Age found its expression in the Philippines in the form of a bridge unparalleled throughout Asia. Originally, the name of the bridge was Puente de Claveria (Claveria Bridge). It is likely that the bridge was named for Philippine Governor-General Narciso Claveria y Zaldua; who was governor-general of the Philippines from July 16, 1844 to December 26, 1849. One of his claims to fame is ordering that Filipinos take Spanish surnames. As a result of its design (steel suspension bridge) its more commonly used name was simply the Puente Colgante. Construction on the structure started in 1849 and was completed in 1852 by Ynchausti y Compania (which was owned and led by Jose Joaquin de Ynchausti). The city government of Manila awarded the corporation a ninety-year franchise for its construction and subsequent operation. According to American documents, the tolls from the bridge were an early source of income for Ynchausti y Compania. One of the more common myths surrounding the bridge is that it was designed by Alexandre Gustave Eiffel (of Eiffel Tower fame). You can even find this story in supposedly reliable textbooks such as “History of the Filipino People” by Teodoro A. Agoncillo: “To avoid traffic jams in Arroceros and Quiapo, the Puente Colgante (now Quezon Bridge), the first suspension bridge in the Far East, was built. Measuring 110 meters long and seven meters wide and designed by Gustave Eiffel…” On the positive side, he correctly identified the location and measurements of the bridge. Unfortunately, Gustave Eiffel was born on December 15, 1832. Ynchausti y Cia commissioned a Basque engineer by the name of Matias Mechacatorre to design the structure. He had already designed a few suspension bridges in the Basque Country and was the logical choice to design the Puente Colgante. Its location connected the warehouses and factories of Ynchausti y Cia. The bridge would become one of the most identifiable landmarks in pre-World War II Manila and was noteworthy for being the first steel suspension bridge in Asia.